Corban has the spirit of an adventurer. 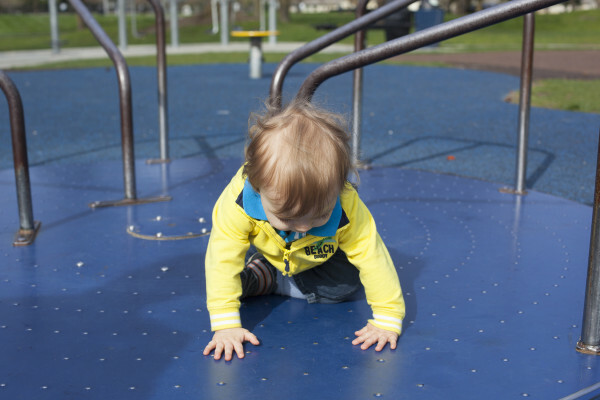 As soon as he could roll, we had to teach him to go backwards anytime he’s going down. Stairs, the bed, the stroller, people’s laps. The boy is pretty much fearless. He can literally go up and back down 20 steps in 30 seconds flat. At 14 months, Corban’s just starting to take his first steps, and he throws himself into them wholeheartedly, especially if daddy or I are there to catch him. 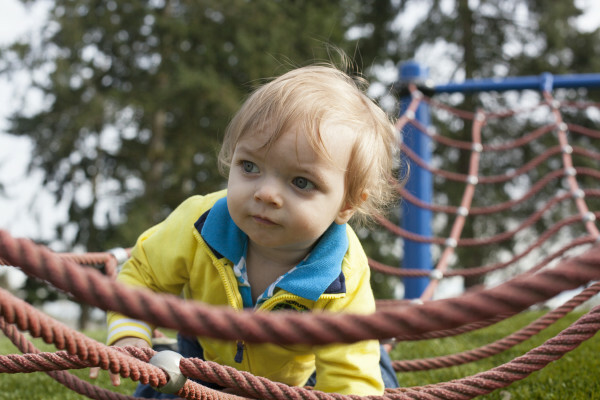 I want to nurture and grow that adventurous spirit, while helping him safely explore the world around him. So now that the weather is getting nicer, we are taking daily trips to the park, and our most recent trip was a pirate adventure. You can take your toddler on a great pirate adventure without buying any costumes or props. 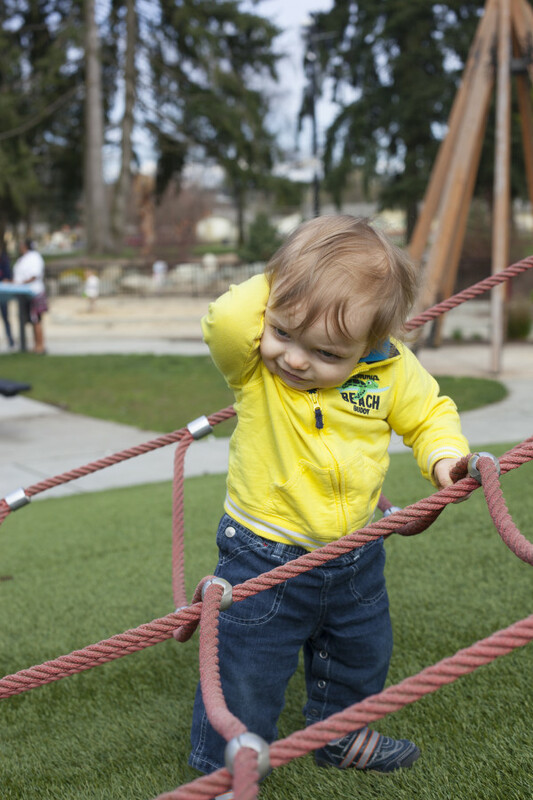 Simply head to the closest playground, and help them learn to use their imagination, while exploring the capabilities of their little bodies. Here’s how we did it. 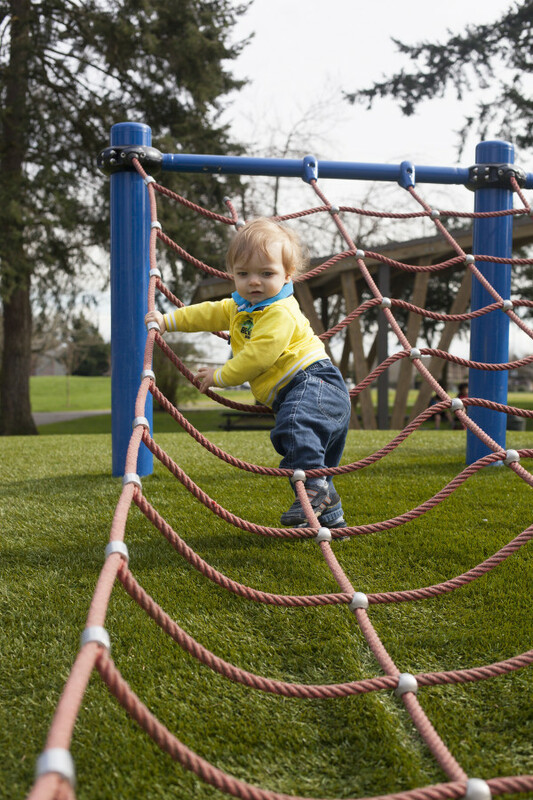 Most play grounds have some sort of climbing structure with platforms. 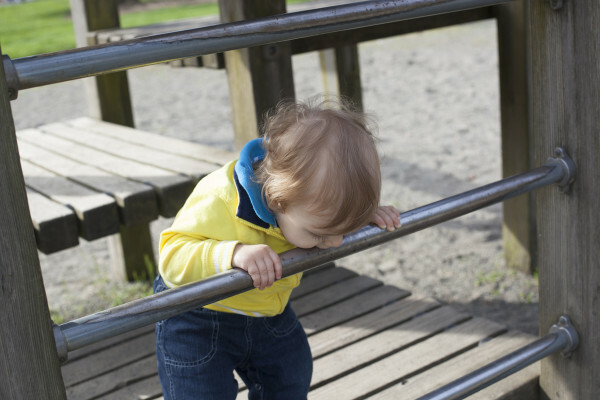 Whether it’s the deck at the top of a slide, or the top of the monkey bars, help your toddler safely climb and take their perch. 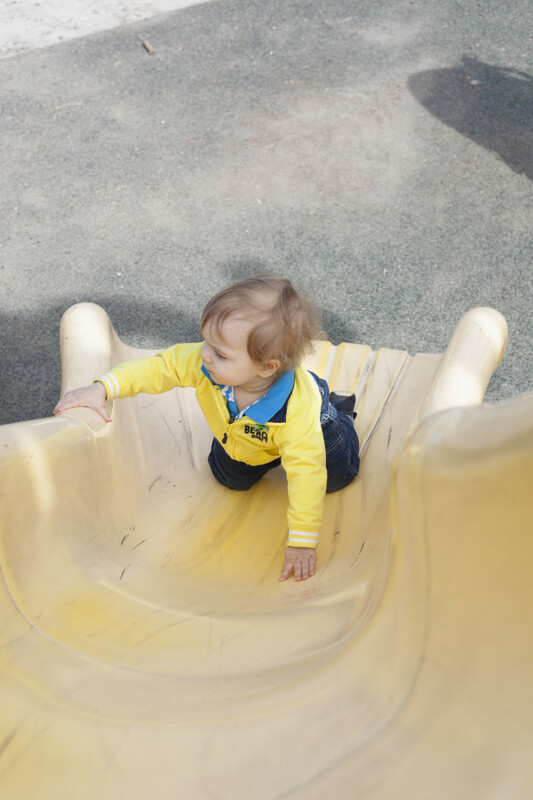 Some kids may want to be on the highest point, secure in the closeness of mom or dad as they survey the playground below. Corban preferred to be independent on a lower platform the he was allowed to handle by himself. Notice the body language? He made it very clear that he did NOT want help to play! It could be a play structure, a tree stump, or a stick, whatever it is, there is something about the feel of wood that just intrigues little ones. Try and find different wooden textures for them to explore, just watch for splinters. 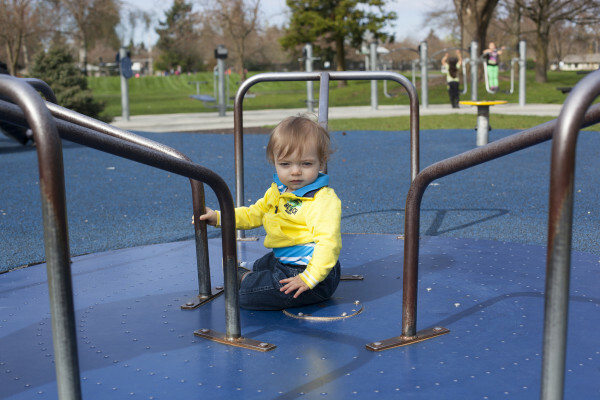 Whether it’s sliding on your lap, or safely strapped into a baby swing, let your child experience the slight stomach falling sensation of a gentle drop. Start slow and easy, they will let you know if they want more. 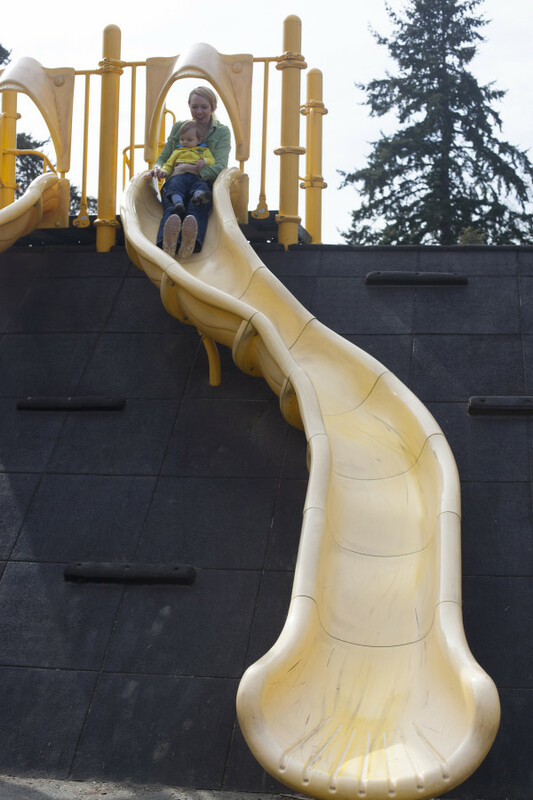 I started out by holding Corban at the top of the slide and telling him that we would go down really fast, but mommy would hold him tight and keep him safe. Sometimes, he would just calmly take it all in, sometimes he would laugh and scream with delight like with daddy in the video below. The entire time we were at the playground, Corban was watching the big kids spin as fast as they could on the merry-go-round. Knowing this appeared to be the biggest attraction for him, I began watching for a rare moment that it was empty. Throughout our play time, I told him that he would get to ride it all by himself during our adventure, but not yet. 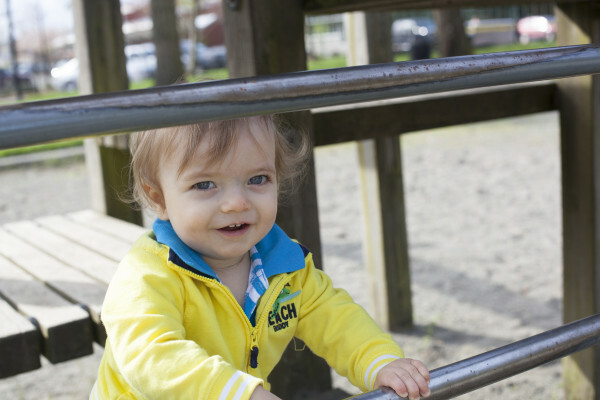 As Corban began to gain confidence in the movement, he started crawling and exploring the texture of the bolts, the smooth rails, and trying to understand holding his body in place as the ground beneath him moved. 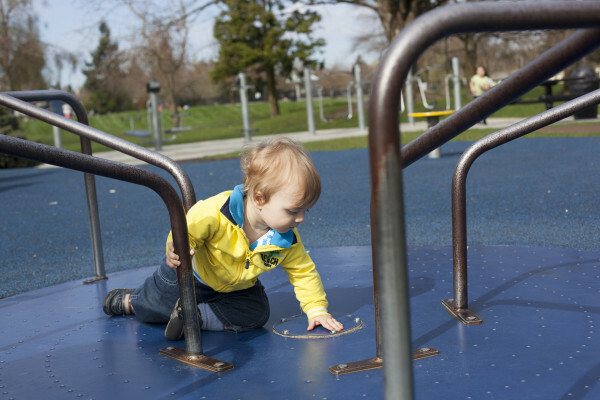 Metal is another great playground texture for toddlers to explore. Corban loved the rivets and bumps on the merry go round, and was so fascinated by the smooth metal pole of the platforms that he just kept running his tongue along it. Which brings me to #5. They put things in their mouth, they rub dirt in their hair, they might even spot the one pile of dog poop some evil pet owner didn’t pick up. So keep a close eye on them for safety, while still letting them enjoy getting dirty if they want. 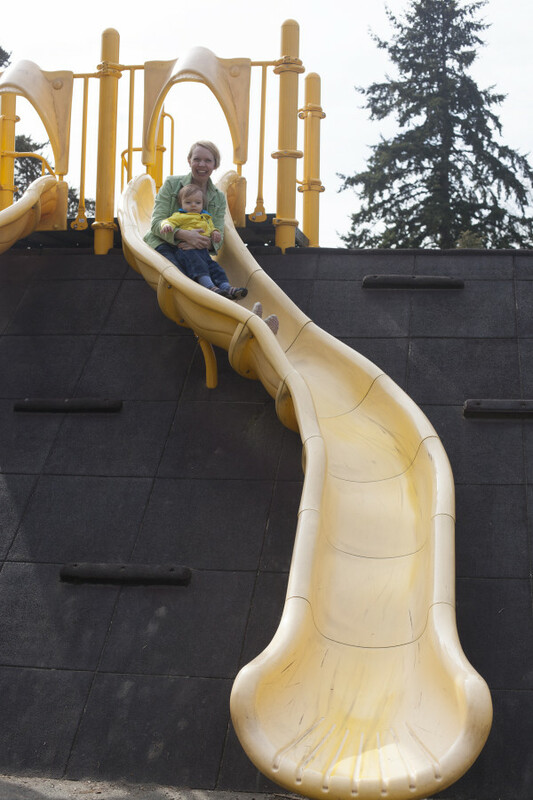 Let your child play freely, and do things like go up the slide the “wrong” way. Find a piece of equipment that no one else is using. I learned that lesson after a little girl nearly had a panic attack that Corban was “breaking” the slide by climbing it. 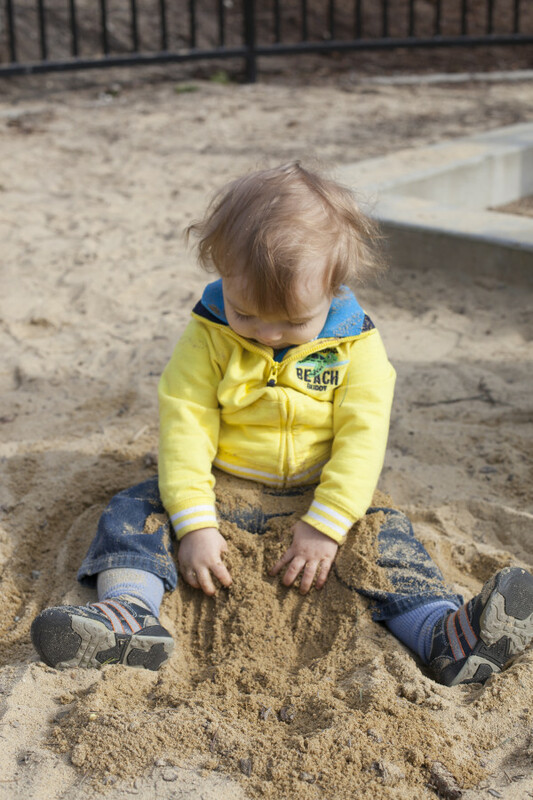 Let your child explore it by themselves, rather than showing them how to use it. 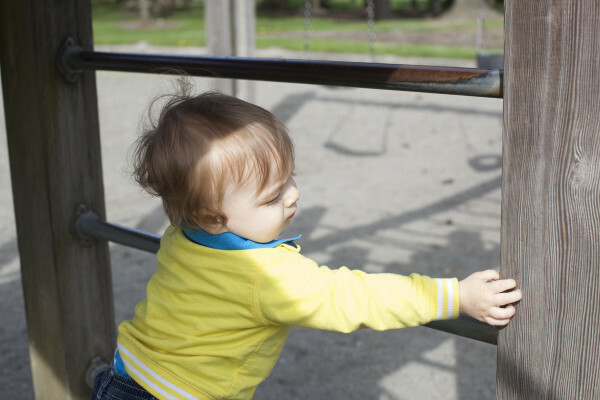 Perhaps it’s pushing the swing instead of riding in it, or crawling under and over the teeter totter. 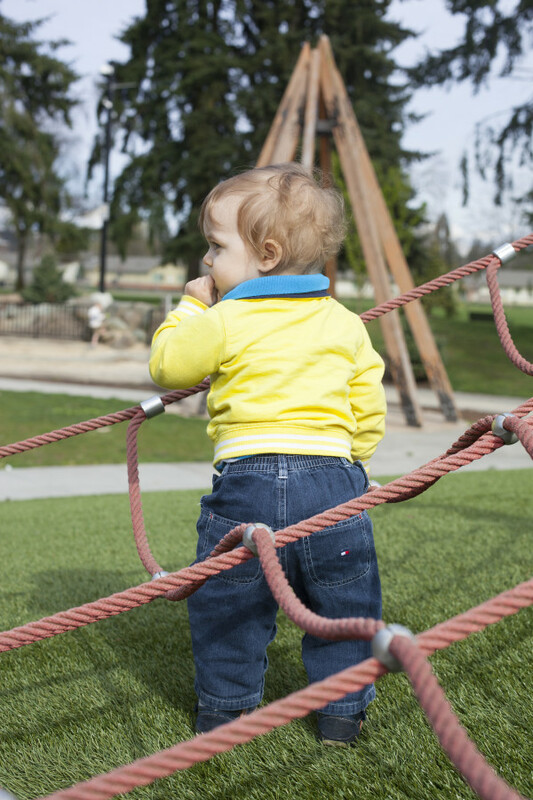 Throw out the playground rules and let them figure out their own boundaries, under your protective, watchful eye. This goes with #4, because it’s about letting your child discover new abilities. 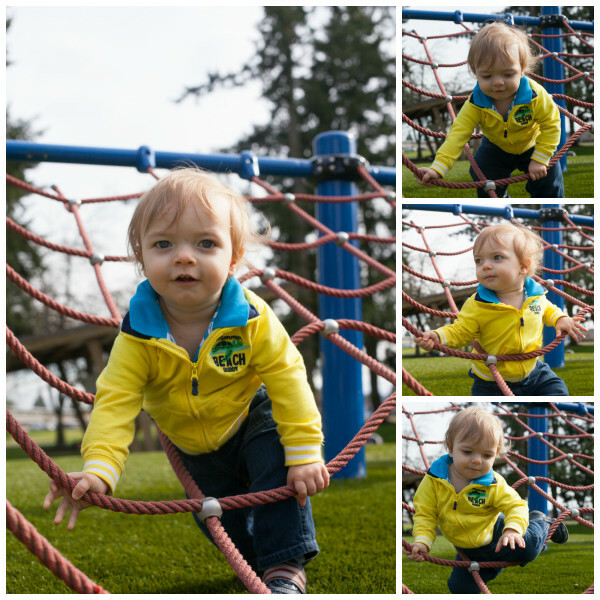 I knew Corban was too little to crawl on the cargo net, but I wanted a cute picture of him with it. I asked my sister to set him by the net, meaning the outer edge, and she plopped him down in the middle of a square. At first he simply stood there, for about five whole minutes. He looked around, felt the rope, and pretty much ignored any attempt I made to get his attention. Then he suddenly decided that if he wanted to move, he’d have to do it himself. He took his first step over a rope, and didn’t fall. 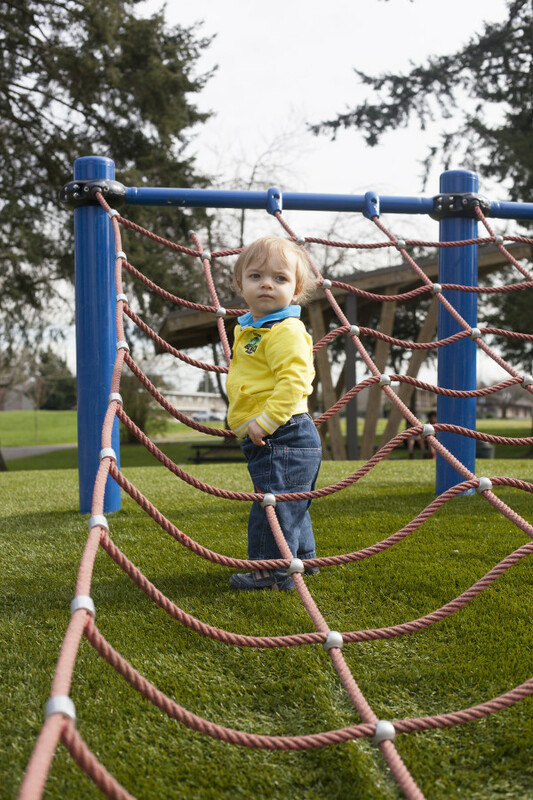 I could see his confidence and excitement growing as he began crawling all the way to the bottom, with no help. It was something I had not even thought he would be capable of, but it was perfectly safe to let him try, and impress us both. 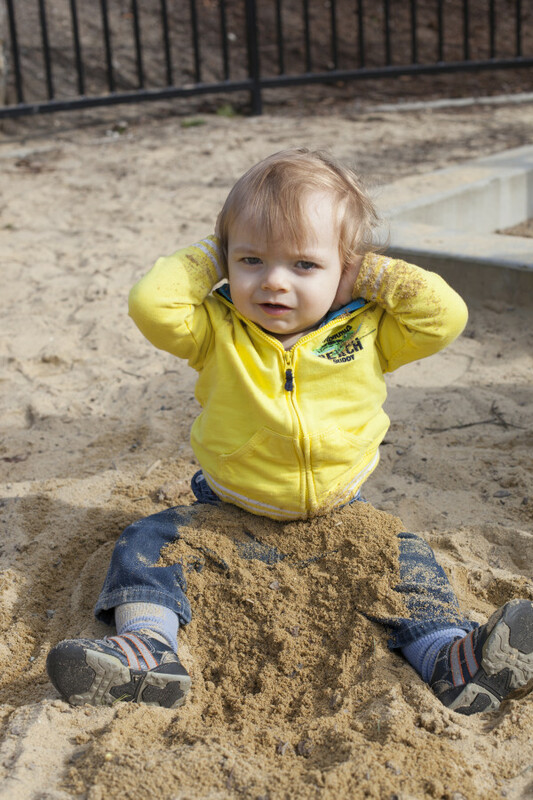 Whether it’s a sandbox, or a bare spot of dirt in the grassy field, your little toddler will most likely want to dig in it. Let them scoop it on themselves, grab handfuls, run it through their fingers. Bury something like a pine cone or rock, and let them uncover it. 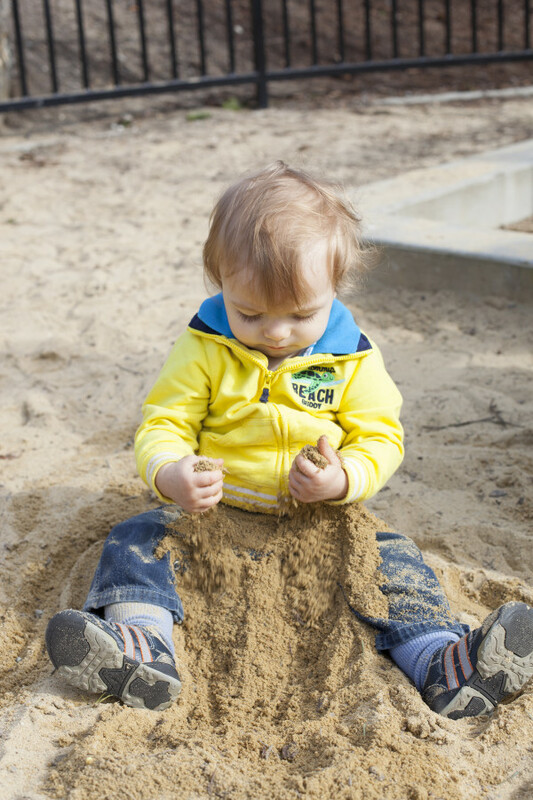 Corban could spend hours in the sand box, if I didn’t have to pull him out at about 15 minutes in, when he decides it tastes good! The most important part of a pirate adventure is having fun. 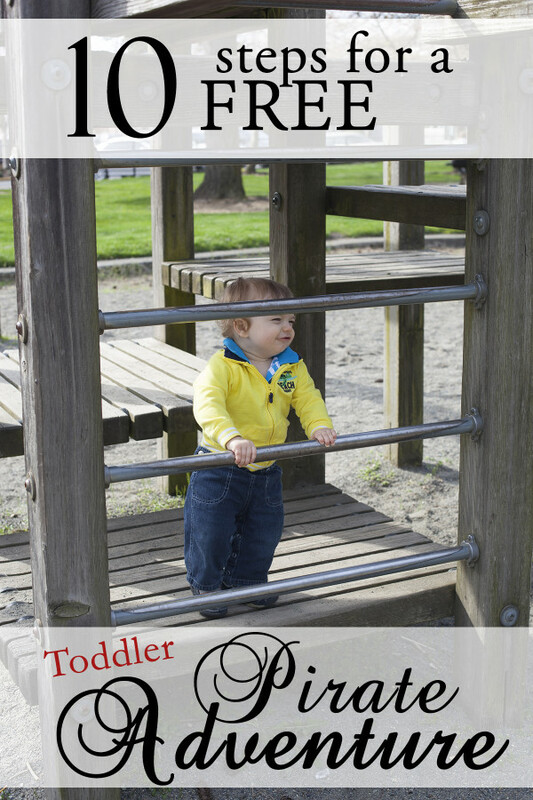 Find the balance between engaging your toddler, and watching them from a distance that makes you both feel safe and secure. Remember that toddlers also tire easily, so be on the look out for cues like eye rubbing, getting fussy, or wanting to be held. Try to end your adventure while things are still fun, with promises of more adventures to come. Want to continue the pirate adventure on a rainy day? Curl up with your kiddo and the all-new Tinkerbell movie, from the world of Peter Pan, “The Pirate Fairy”. Get your copy now on Blu-ray™ or Digital HD, and check out the Disney Fairies Facebook page for more adventure.